The Center for Human Rights and Global Justice invites you to a discussion of the findings of the Inquiry on Protecting Children in Conflict. Recent years have seen an escalation in impact of war on children – from the sexual enslavement of children to the deliberate bombing of their schools – subjecting a generation of children to targeted violence and indiscriminate attacks. Crimes against children which should send shock waves around the world are coming to be accepted as commonplace. In Syria, Afghanistan, Somalia, Yemen, Myanmar and elsewhere, international laws and human rights provisions developed in the 20th Century are being violated at an alarming rate. This failure to protect children in conflict raises questions as to whether existing international law norms and institutions provide sufficient protection and accountability. The Inquiry on Protecting Children in Conflict examines whether there is more that international law can do, practically and effectively, and considers whether there are new laws or procedures that may enhance the protection of children. Chaired by former UK Prime Minister Gordon Brown – and sponsored by international charities, Save the Children and Theirworld – the Inquiry was commissioned in April 2017. It is comprised of a legal panel, led by Shaheed Fatima QC, and an advisory panel of globally influential policy-makers, thinkers and activists. Learn of the Inquiry’s findings in this panel discussion moderated by CHRGJ Faculty Director and Co-Chair, Professor Margaret Satterthwaite. 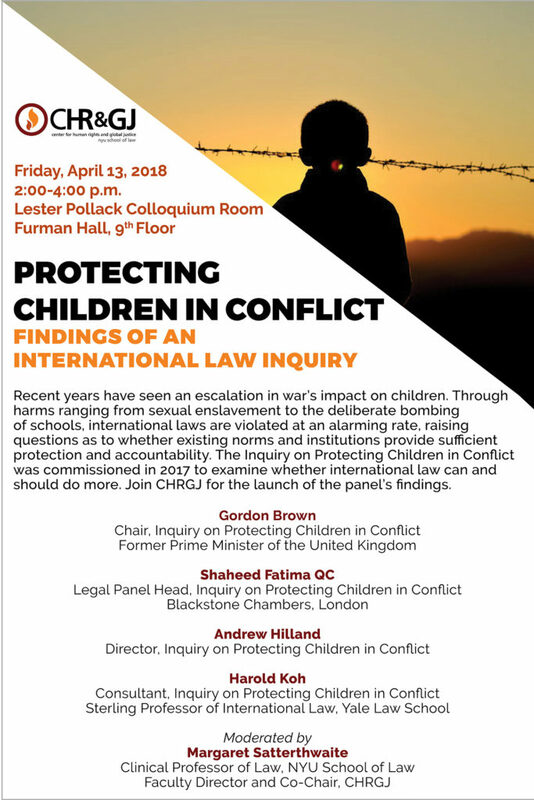 Protecting Children in Conflict: Findings from an International Inquiry will be livestreamed starting at 1:00 p.m.. You can stream the event below or on NYU Law’s website. This event is co-sponsored by Just Security and the International Law Society (ILS) at NYU School of Law.